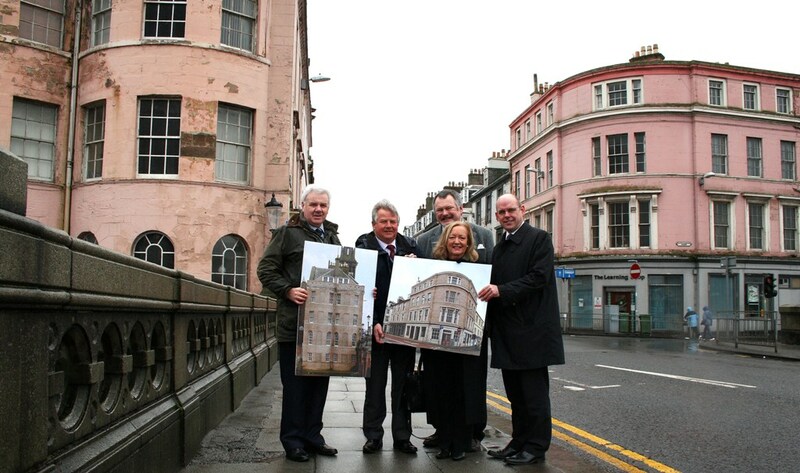 Approval of planning permission by South Ayrshire Council’s Regulatory Panel has given the green light for the first phase of a multi-million pound project to transform the historic gateway to Ayr town centre. The £2.5 million Ayr Townscape Heritage Initiative (THI) – funded by the Council and the Heritage Lottery Fund (HLF) – will transform the ‘pink buildings’ on New Bridge Street through a sympathetic restoration and refurbishment programme that will ensure the special historical and architectural character of these buildings is properly maintained. * new painted metal gates at the entrance to the passageway. Welcoming the approval of planning permission, Councillor Peter Convery, South Ayrshire Council’s Portfolio Holder for Sustainability and the Environment, said: “This is a key stage in the exciting project to give these landmark buildings the chance to shine as they should. “I am delighted the works will be sympathetic to the conservation status and character of the local area, making a positive difference that will reaffirm the buildings’ iconic status as a fantastic gateway into the town. Greig Mathieson, who owns a top floor flat at 1-5 New Bridge Street, said: “I’m really happy that planning permission has been granted and very excited to see how the building will look when the works are completed. John Harkiss of Harkiss Developments Ltd, who own a number of commercial properties at New Bridge Street, added: "This is very good news for the buildings and is a definite step in the right direction to ensure there is an attractive and welcoming entrance to the town. I'm particularly pleased the project will see the removal of the existing paintwork and the restoration of the stonework so the building will look the way it was always intended to be. This is going to make a huge visual difference and help to promote the economic regeneration of the town centre." The Ayr THI works, which are being managed by Ayr Renaissance on behalf of the Council, will not only ensure the character of the area is maintained, it will also provide the opportunity to encourage traditional conservation methods and techniques, support on-the-job training and raise awareness of conservation as a potential career. The application for listed building consent has been referred to Historic Scotland as required. Work on the Ayr THI is expected to get underway in spring, subject to the conclusion of the procurement process, and will take around 18 months to complete.